We’ve talked about the date before. It was such an important food in ancient times, it’s hard not to be impressed by its ubiquity and its longevity. In fact, the history of the date was featured in one of our most popular posts, Ancient Mesopotamian Palace Cakes from Ur! Today we thought we’d revisit the date with another fabulous, sticky sweet indulgence, the Roman treat called Dulcia Domestica. First, let’s refresh our memory of the history of this tiny treat, courtesy of our previous post. The date wasn’t just beloved by the Mesopotamians. It became a staple in many cultures including the ancient Egyptians, Romans and other groups across the Middle East. Even now in the 21st century, the little date is still going strong and in fact is in the news with a remarkable saga. 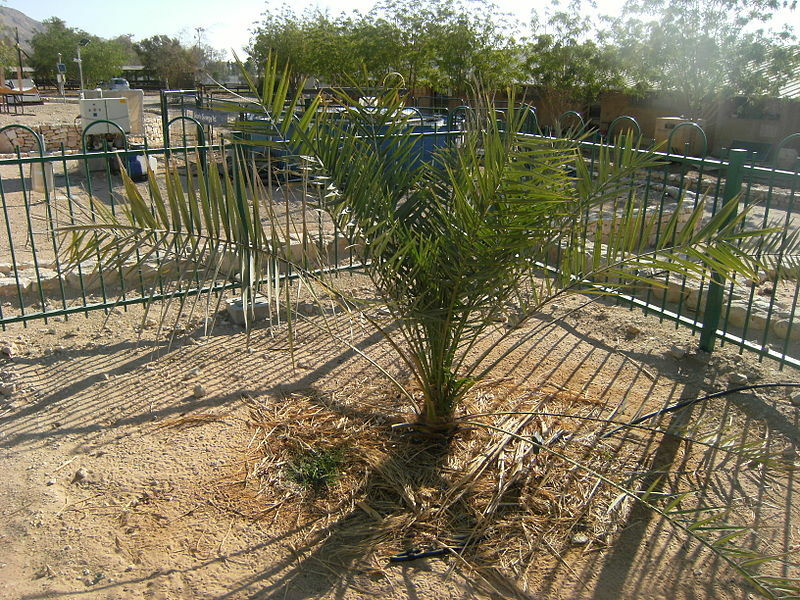 Back in the 1960s seeds from a Judean date palm tree were discovered during excavations in Masada, Israel. The seeds were estimated to be around 2,000 years old. Ten years ago one of the seeds was planted in the hopes that it would thrive and grow into a strong and prosperous plant. Today that date palm seed is all grown up into a mature tree, dubbed Methuselah for obvious reasons, and is even reproducing. According to Elaine Solowey, PhD., director of the Arava Institute for Environmental Studies at Kibbutz Ketura in Israel, “He is over three meters [ten feet] tall, he’s got a few offshoots, he has flowers, and his pollen is good. We pollinated a female with his pollen, a wild [modern] female, and yeah, he can make dates.” Way to go, Methuselah! By the way, Methuselah’s fertility and subsequent “offspring” aren’t the only pieces of exciting date-related news. A new study suggests that date syrup may have more effective antibacterial compounds than another of our favorite ancient superfoods, honey. (Check out our honey post and candy recipe here.) In tests of the effects of date syrup on colonies of bacteria in a petri dish, the date syrup kicked the bacteria’s proverbial rear-end. When the syrup was mixed with a range of disease-causing bacteria – including Staphylococcus aureus, Escherichia coli, Enterococcus spp. and Pseudomonas aeruginosa – it inhibited their growth in about six hours, which researchers say is faster than manuka honey, which is known for its antibacterial and wound healing properties. While we certainly don’t advocate giving up your time-tested, deliciously nutritious honey, you might want to consider adding date syrup to your diet. The testing is still in the early stages, but it’s very promising. Just make sure it’s actual date syrup, not some manufactured version made from sugary substitutes. It’s the phenolic compounds in the real deal that matter. Finally, on to the eating! Make a batch of these little gems from this original Roman recipe and do yourself a favor nutritionally at the same time. You’ll be pleasing your palate, communing with the ancients and fighting off that nasty cold that’s been going around. Mix the ground nuts/kernels or whole blanched almonds with the spice of your choice. Stone the dates and fill them with either the ground nuts/kernels or whole blanched almonds. Place the nuts in a shallow sauce pan with the red wine and honey and allow to simmer for approx. five to 10 minutes. Serve with a bit of the wine sauce drizzled on top.